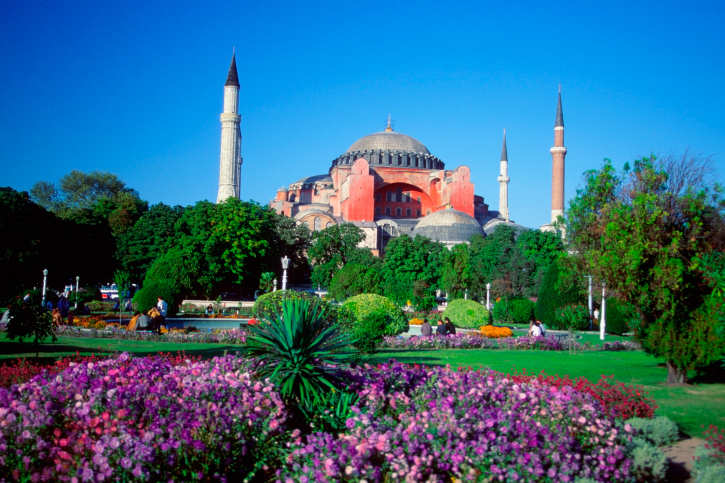 Istanbul’s three blockbuster attractions—the Blue Mosque, Hagia Sophia, and Topkapi Palace—are world class attractions in a very real sense. They’re highlighted in both the history books and the travel books, and often make those “ten best” or “top 20” lists travel magazines like to compile. That means they’re almost always crowded, with long lines to get in and all too often too many people in an individual room to see the room properly. But that comes with the territory. Just try to get a good look at the Mona Lisa when you’re at the Louvre. From what I saw, the best strategy is to get there just at opening time; crowds build later in the day. Depending on the amount of detail you seek, you can do the Hagia Sophia and Blue Mosque in as little as a half hour or so. But the Topkapi complex includes lots of separate buildings and exhibits, and you’ll want to spend several hours there. As in so many other major visitor centers, a good way to get a feel for Istanbul is to take one of the two hop off, hop on open-top double-decker bus lines that circulate around the city. Locals say to take the “red” route; it costs 20 euros (about $28) and takes a little over an hour for a full circuit. Although it has six stopping points, the only places where it sells tickets and waits for customers are around the main square between the Hagia Sophia and Blue Mosque, and the central square in Taksim. I found the locals to be extremely cordial hosts to visitors—and pretty good linguists, as well. Just about anybody on the street is glad to help with directions. However, when you’re walking around the Sultanahmet area, it’s all too easy to mistake a scam artist for a cordial and helpful individual. But shills abound: well-spoken, friendly types who usually start by asking “where are you from” and assuring you they’re not trying sell themselves as guides. Although Istanbul has a few international-class chic (and expensive) restaurants, most of the dozens of ordinary spots you see around town seem to post about the same menus: kabobs, pizza, pide (which they call Turkish pizza), and spaghetti. You almost think that someone prints up a standard display and sells it to all the places. In a separate strain, more than a dozen seemingly identical fish restaurants line the main boulevard along the Bosporus and Sea of Marmara waterfront. Actually, many of those ordinary tourist spots serve up some very tasty examples of the local cuisine. I had several nice dinners for 30 to 40 liras (including a big glass of draft beer). Leaving Istanbul, travelers have to go through two separate and security screens—once just to get into the vast departure hall and again to get into the gate areas. I have no idea why the double effort is necessary, but both are relatively tight. Double screening aside, Istanbul is visitor-friendly and accommodating. I highly recommend it, especially to those interested in world history.